Hi, y'all. It's Thanksgiving, and I plan to spend my day eating, giving thanks, and loving on my family. I hope you are all warm and safe today. Happy Thanksgiving! I hope your day is wonderful and your turkey finishes cooking eventually. It seems to be a holiday tradition at my mom's that we eat at least an hour later than planned because the turkey isn't getting cooked. Fortunately I love my family, so spending time with them is a good thing. We have a huge family. My parents have 4 kids and 10 grandkids and 2 great-grandchildren, 4 child-in-laws, and 2 grandchild-in-laws, and we all live close together and like to spend time together. It's never quiet. Ever. But that's not what I came here to talk about. I came here today to make some confessions. Pumpkin pie confessions. You see, in my family, I am in charge of pumpkin pie. My baby sister doesn't like pumpkin pie. She's in charge of apple pie. My other little sister, well I don't think she likes pie at all. I think she's in charge of eating the turkey. But she makes amazing Christmas cookies, so it all evens out. So for the last 30 years, I've been making pumpkin pie, and I have a few confessions to make. 1). I make an amazing pie crust. My Hillbilly brags to people about my pie crust. It's light, delicious, and flaky. But to save my life, I cannot make a pretty pie crust. I can't even make a not-horribly-ugly pie crust. So I need to confess that I have pie crust envy. I look at all the pretty pie crusts in the magazines or at other people's tables and wish I could make my pies look that good. I saw a picture the other day where they had used a cookie cutter to cut the pie crust into little leaf shapes. Somehow they even pressed in the little leaf veins. 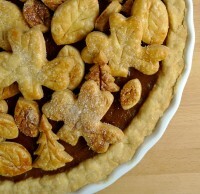 THEN, they took the little leaves and layered them all over the top of the pie. It was beautiful. I loved it. I wanted to rush home and try it myself. Then I got a grip on reality; it's never going to happen. I am embarrassed to have anyone see my pies. I'm seriously considering blindfolding people when I serve them my pie, removing the blindfolds only after they've sampled the flaky deliciousness. 2). I don't follow the directions in the recipe. I don't mean I improvise on the ingredients. Nothing wrong with that, but I don't. But the recipe says to mix the dry ingredients in a small bowl, then mix the wet ingredients in a large bowl, then add the dry stuff to the wet stuff in the big bowl. What?? Why?? Will the sugar and spices not mix if I don't mix them together separately from the eggs and pumpkin? Will the eggs and pumpkin conspire to keep them apart? I don't think so. I mean, I've been baking pies this way for 30 years, and I've never yet had one come out with all the sugar on one half of the pie and the cinnamon on the other with the ginger and cloves fighting it out in the middle. Why would I get another bowl dirty? Okay, I'm confessing this, but I'm not repenting. I'm going to keep right on doing it this way. 3). The recipe calls for evaporated milk. Most of the milk makes it into the pie, but I always save the last two swallows so I can drink it. I love the taste of it, but only two swallows worth. More than that and I suddenly don't like it anymore, so it's not worth it to buy a whole can just for drinking. I think of it as a special baking day treat. (I do the same thing when we make homemade ice cream, but that's another confession, so forget I said it.) It's weird, I know, but don't judge. It doesn't hurt anyone and the pie is fine. So there! So there you have it, my pumpkin pie confessions. What are your kitchen confessions? What little kitchen quirks do you have that you just don't talk about? Go ahead and share. You'll feel better for it.